As mentioned in the last post, sometimes too much of a good thing may be too much of a good thing. Hence, all the delicious and authentic central-Texas barbecue may have been getting a bit too repetitive. Apparently, this wasn’t true for my son because he can eat meat and only meat every meal. However, the rest of us needed a change of pace. Therefore, we ended up at Cured for lunch. Yes, we stayed with the theme of meat, but not barbecue. Rather, just like its namesake, we feasted on cured meats. 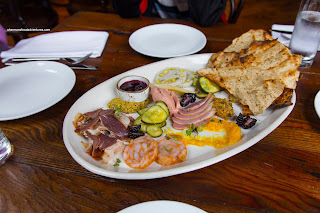 That we did with 6 Selections (for $28.00) consisting of smoked duck ham, chicken liver mousse, catfish mortadella, porchetta di testa and smoked gouda. This came with all the fixin’s including charred flatbread, orange marmalade, 2 types of grainy mustard, blackberries and berry compote. For me, I thought the duck ham was the best being tender and impactful with a smoky saltiness. Surprisingly, the catfish mortadella did not taste murky like I expected. It was still somewhat fishy, but in a pleasant manner. Fatty, sliced thin and full of rich meatiness, the porchetta was buttery delicious. Lastly, the chicken liver mousse was creamy, rich and nicely spiked with brandy. 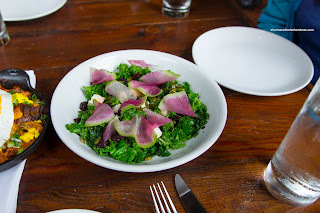 Since we were devoid of vegetables so far on this trip (to the delight of my son), I made a point in ordering the Kale Salad with black garlic vinaigrette, smoked feta, dried cherries and pumpkin seeds. Turns out that this wasn’t only a great way to get some greens, it was also rather delicious. The earthy tanginess of the vinaigrette was appealing and completely flavored the tender kale. Add in the sweetness of the cherries and smokiness of the crumbly feta, this was more than just a salad. 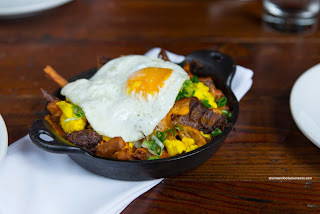 To balance off this healthiness, we got the Pig Cheek Poutine with a fried egg on top. I found the house-cut fries to be nicely potatoey where they were drenched in a salty, but tasty braising liquid. The pig cheek was generous in portion and tender. All of the heaviness was counteracted somewhat by the pickled cauliflower. To top it all off, we also got the Masa Fried Soft Shell Crab Po’ Boy with remoulade, lettuce and tomatoes. After the first bite, it was clear that this was not as heavy as one would expect. 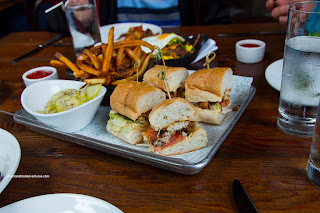 The bread was soft and light while the crab was crunchy, yet not overdone. There was enough remoulade for moisture and some spice. 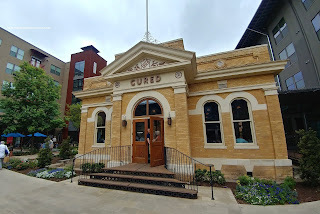 Overall, we enjoyed out meal at Cured. The unique and varied options of cured meat helped the restaurant live up to its namesake. Too bad I don't live nearby because I would be return over and over again trying out the different meats.